This is a follow-up to an earlier post about the Southern Pacific’s branch line to Friant, California as the subject for an achievable layout. I think this branch is interesting enough to warrant a closer look. 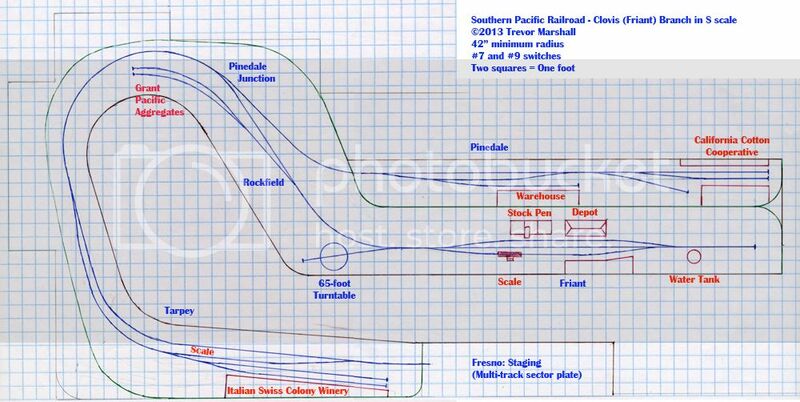 Since Dan Navarre at River Raisin Models has announced he will import a run of brass Southern Pacific “Valley Malleys” (2-6-0s) in 1:64, I decided to do a quick sketch to determine how an S scale Friant Branch layout would fit in my layout space. This is a very rough sketch – and as far as I’ll take it. I’ve included some notes below the plan. – I’ve flipped the Italian Swiss Colony winery at Tarpey by 180 degrees because it fit the space better. It would look right in layout photographs, but on the prototype it was a facing point switch for trains headed to Friant. – The winery is an interesting customer, using the railroad to ship bulk wine in multi-dome tank cars and receiving inbound refrigerator cars loaded with grapes. Looking at photos, I’m guessing two cuts of tank cars were spotted on both spurs near the bumpers, while refrigerator cars were spotted in two cuts near the switch. Grapes were also delivered by truck, and photos of the winery show a long line of trucks on a driveway between the main and the siding here, waiting to be unloaded. The winery had its own track scale, and the operation was surrounded by a fence with the run-around and two spurs inside locked gates. By itself, the winery could be the basis of a satisfying one-industry layout. – I don’t have a map of Pinedale Junction, but a description notes at one time the junction was a wye, with one leg subsequently removed. Trains that had work in Pinedale would take only the cars for Pinedale down the branch, leaving the rest of the train at the junction. In Pinedale, crews would switch the cotton company warehouses, and leave with lifts in tow. Back at the junction, traffic from Pinedale was left on the branch to be collected on the way back to Fresno. – Rockfield was the site of a company ballast quarry and crusher. There should be four spurs, but I had room for two. Like the prototype, these spurs are reached via a sharp downgrade from the mainline. This often required crews to haul loads out of the quarry in multiple cuts of cars. Loads were collected and taken with the rest of the train to Friant, then backhauled to Fresno for routing to the rest of the Espee system. – Friant – the end of the line – had two double-ended spurs and a stub spur serving a turntable. – I had to reverse the direction of the turntable spur in Friant – the switch is in the right spot but it should head toward the stock pen. It fits the layout room better this way and keeps the turntable close to the aisle for easy operation and maintenance. I also used a 65-foot turntable instead of the prototype’s 70-foot model – basically because I know how to build a 65-foot turntable in S scale. – I’m not sure where the track scale was in Friant, but it was apparently used to weigh the loads of ballast out of Rockfield. I’ve placed it arbitrarily. – The end of track was in sight of the massive Friant Dam. It can be seen in photos of the railroad in Friant, and a photo or painting on the backdrop at the end of this peninsula would be a really nice touch. 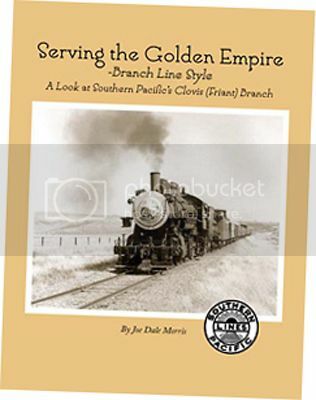 My information on this branch comes from the photos, maps, text, charts, tables and tour of the line in Serving the Golden Empire – Branch Line Style by Joe Dale Morris. It’s a great book and I recommend it to anybody who wants to know more about this really neat branch line operation.